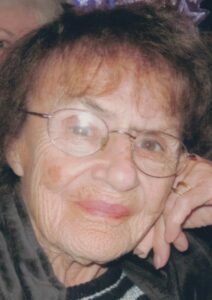 AUBURN - Gloria L. Donohue died Thursday Jan. 24, 2019. AUBURN – Gloria L. Donohue died Thursday Jan. 24, 2019, at The Hospice House of Androscoggin Home Health Care & Hospice, with her loving family at her side. She was born in Hudson, Mas. on Sept. 25, 1925, a daughter of the late Leo and Adrienne (Gagnon) Lerette. She was educated in Massachusetts and Maine. Gloria Loved to work. She loved the many people she worked with and was loved and respected by her coworkers. She made friendships with the younger employees and enjoyed it when they would take her on shopping trips. “Ma” worked for several different restaurants as a waitress through the years and was most known for working at CMMC in the cafeteria, and Ronnie’s Vegetable Stand. She was forced to retire when she was in her 80’s and would be still working today if she could. Gloria was the “Queen” of garage sales, she enjoyed doing crossword puzzles, going on bus trips with her sister Claire, going to Cabbage Island, and traveling to Florida and Arizona to visit with family and friends. She also started the family tradition of spending summers at Old Orchard Beach and the family still carries on this tradition today. “Ma” loved life and enjoyed the simple things, she adored her grandchildren and treasured her time spent with them. She also loved her cats and Sophie her dog. She is survived by her three daughters, Carol Proteau and husband Larry of Lewiston, Barbara Gervais and husband Clement of Lewiston, and Judy Dupile and husband Clifford of Lewiston; her ten grandchildren, Brian, Keith, Stacy, Clement, Tina, Randy, Amber, Brandon, Zachary and Tyler; 12 great-grandchildren; three great-great- grandchildren; and many nieces and nephews, who she was like a second mother to and loved them all dearly. She was predeceased by a daughter Nancy Rose Donohue, a son Michael Raymond Donohue; two sisters Claire Allard and Doris Rioux, and a brother Raymond Lerette. You are invited to offer condolences and pay tribute to Gloria’s life by visiting her guest book at www.thefortingroupauburn.com. Visitation at Fortin Auburn Thursday, Jan. 31, from 3-5 p.m. A celebration of life will follow at 5 p.m. at the funeral home. Committal will be held at a later date at St. Peter’s Cemetery. Arrangements are under the care of the Fortin Group/Plummer & Merrill Funeral home, Cremation & Monument Services, 217 Turner St., Auburn 783-8545.